Official opening for Caroline Bay Marina! The Caroline Bay Marina was formally opened in a ribbon-cutting ceremony this afternoon. Despite light showers around 100 people trekked to Morgan’s Point for the ribbon cutting, including developers Nelson Hunt and Craig Christensen and a number of sailors from the boats already docked at the marina. They noted their partner in the project, Brian Duperreault, who was unable to attend, and former premier Alex Scott, who Mr Hunt desribed as a visionary in the Caroline Bay project. Even before the ceremony began, around a dozen vessels of varying size were docked on the marina’s floating arms. Michael Dunkley, the Premier, noted the history of the site, praising the developers for sticking with their vision and developing a valuable new asset for the island. Caroline Bay Marina held a ‘dock wetting’ yesterday to celebrate the completion of phase one of Bermuda’s newest superyacht marina. Seniors will be able to watch America’s Cup races on board a 157ft superyacht, thanks to a partnership between Caroline Bay Marina and Age Concern. The two teamed up after a senior, who contacted the marina to ask about the races, noted that there were no opportunities for seniors on a fixed income. “It touched our hearts to hear how excited our seniors are about America’s Cup and all the attention Bermuda is receiving from this event,” Jodi Lewis, spokesperson for the Marina, said. The senior reached out to the marina after a radio interview, which led to executives fostering a partnership with the charity. Age Concern will assist with identifying seniors interested in viewing one of the races on board the yacht. Caroline Bay Marina will donate tickets to Age Concern to distribute to their members based on a set criteria. Seniors selected by Age Concern will enjoy a sail on board the Arabella, viewing of a race, tour, buffet lunch as well as open bar. The event also includes expert commentary by Jack Griffith as well as three large screens that will stream the races live for those who want to remain in the large dining room area. The marina is really looking finished now! Here are photos taken yesterday with the finger piers and ramps installed. Also the roof has been added to the Marina building. A walk down the newly installed ramp at Caroline Bay Marina! The caps are on the pilings and the east ramp has been installed. The Marina is now starting to look finished. We are on the home stretch for AC35 here at Caroline Bay Marina! Experience Bermuda and Caroline Bay, Bermuda Aboard the Arabella! Installation of the docks is nearing completion and we've started putting on the finishing touches! The white caps have been installed on the pilings and the east ramp was installed yesterday. Its March 17th and the Marina is coming together. Here is a brief update from our CEO, Ralph Richardson. On February 2, 2017, the utilities infrastructure for the resort and marina were completed and the electricity was turned on at the full site for the first time since the US Navy left the former US Naval Operations Base in 1995. Prior to the switch being turned on last week, the entire development site was being powered by multiple generators located across the development site. This was a major accomplishment as the Morgans Point Peninsular, on which the Caroline Bay complex is being built. The expansive development project stretches for over a mile. Photos show the Marina development project and workmen pulling wires through the main dock in preparation for the pedestals which allow marina clients to connect to fresh water and electricity. Of course, the power-on event is significant as far as the marina is concerned. While there still work to do on the dock installation, three of the 4 main docks are in place and will soon have the wiring ready for installation of the pedestals in time for our first yachts expect in late April. The building contractors have pulled out all the stops in the development of the marina building which will house the Bermuda Customs and Immigration clearance officers, the Marina manager, showers and rest rooms for visitors on smaller yachts and possibly a small retail facility. As is the case with all of Bermuda, Caroline Bay is working at full speed to ensure that everything is ready for the island’s largest international event in our history, AC35. “I am thrilled with the progress and the response we have received from the international yachting community. This is a major investment in the development of Bermuda’s superyacht berth inventory as we look forward to hosting vessels up to 300 ft in length at our new marina”, says Marina CEO Ralph Richardson who also states, “we still have space available for yachts over 100ft and some still available for smaller vessels". The lights have been turned on at Caroline Bay as the redevelopment of Morgan’s Point barrels forward. A utility trench, stretching a mile from the Southampton Railway Trail to the tip of the peninsula, has been completed, bringing power to the site, including the Artemis Racing base. The instillation will provide electricity for the first phase of development, which includes 149 residences and a 79-room hotel, along with the marina, which will in turn provide power to visiting yachts. Premier, The Honourable Michael Dunkley J.P. M.P. praises the progress made at Caroline Bay and Caroline Bay Marina and thanks all involved in the project. We're Near the America's Cup Race Course! Caroline Bay Marina is conveniently located on a peninsular in the Great Sound. The America's Cup races will take place just to the north of our location. From our offices near the Marina, we can watch the AC boats training in the great sound less than a mile away to the north. To the south, the International AC Youth Qualifiers will take place within yards of our marina. Location is everything - come and join us at the centre of all the action. The second and final component of the attenuator docks is now being put into place. Once both docks have been completely installed, the next phase will be the installation of the inner marina docks and finger piers. We are still on schedule for a mid-March completion. Photo: The main wave attenuator / docks are now being installed. What an exciting year it has been here at Caroline Bay Marina. As we begin 2017, we would like to provide an update on the status and progress of the marina during its construction phase. Caroline Bay Marina is located in the Little Sound on the Morgan’s Point Development, in close proximity to the Americas Cup racing in the Great Sound. Our Marina will offer roughly 2,340 linear feet of dock space available for 30 + super yachts docked Med style on the perimeter docks. Also the Full service marina will provide berths available for 80 smaller vessels from 20 feet in length to 80 feet. Please note: We do have berths for super yacht tenders as well. The main southern wave attenuator (720 feet) is being installed while the eastern section (458 feet) is expected to be completed by the end of Jan 2017. This will mark the completion of the docks and finger piers. All marina services including electricity will be installed and completed between the end of February and mid-March. Caroline Bay Marina will host a number of exciting events throughout May and June 2017. These events include, but are not limited to concerts, happy hours, dinner shows, golf tournaments and so much more. The main attraction during the races will be Arabella, a 157-foot sailing yacht that we have secured to provide access for our marina clients to watch the race right on the race course during race days. Arabella will also be available to provide local cruises, cuisine and drinks hosted by local Caroline Bay executives and other special invited guests. All clients and guests will be able to participate in non-racing day activities and events unless otherwise indicated. We will be releasing our official event schedule in February 2017. 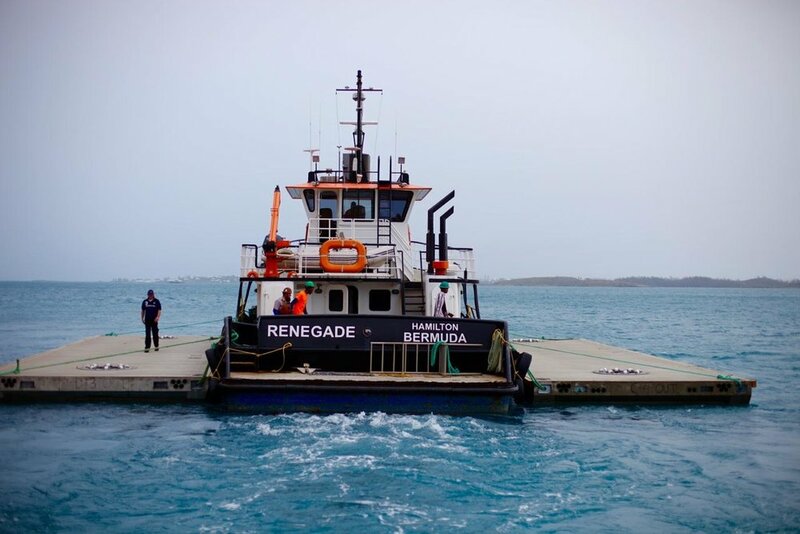 36 pontoons arrived in Bermuda today aboard the Stadiongracht and where promptly tendered away by the Renegade to Caroline Bay Marina. The pontoons range in length between 40ft and 65ft and weigh around 60 tons each. 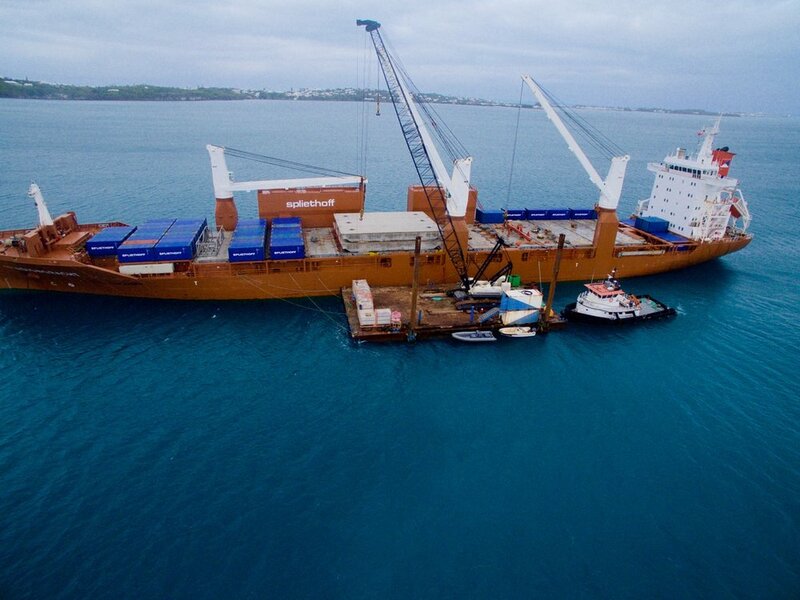 A ship carrying a huge cargo of specially built pontoons for the Caroline Bay marina has arrived in Bermuda. The Stadiongracht, which originated in Finland, dropped anchor in the Great Sound on Friday. 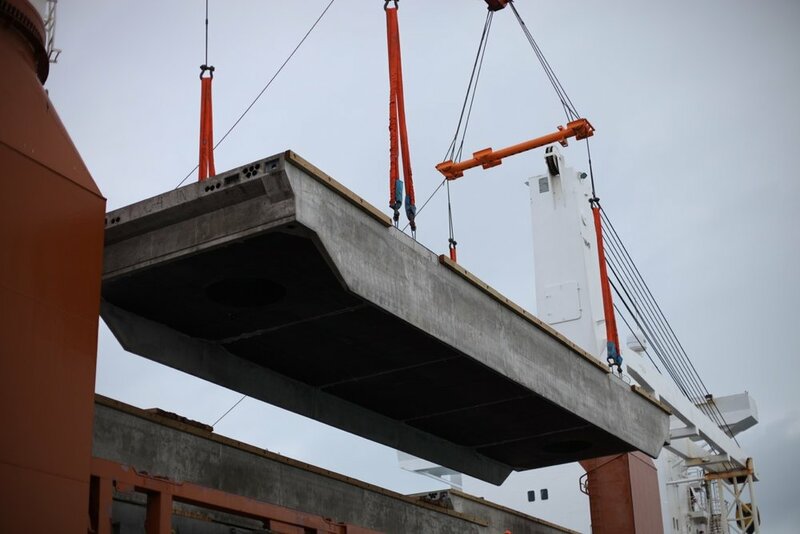 A total of 36 pontoons, which range in length between 40ft and 65ft and weigh 60 tons each, have been unloaded from the vessel and assembled on the water. The structure will form the backbone of the marina and will be cemented into place in the coming weeks.